You don't have to spend a fortune renovating your house to ensure a quick sale at the best price. Some of the most effective fix-ups are also the cheapest. Spending just $400 to $500 on fresh landscaping, for example, can boost your home's value by $1,600 to $1,800, according to a survey of real estate agents conducted by HomeGain, an Internet real estate service. Spend another $300 on cleaning and de-cluttering your home, the survey found, and you could add another $2,000 or more to the sale price. 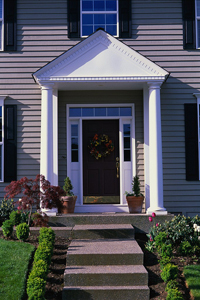 Revive a tired exterior. Painting exterior doors and window trim can freshen your home's look without the huge expense of a complete exterior repainting. Shine or replace worn door knockers and hardware. Replace or remove torn screens or damaged storm windows. Make sure exterior lights are working and have fresh bulbs -- some buyers like to cruise by your home at night to see how it looks. Clean your windows. You want your home to look as light and bright as possible. Dirty or spotted windows drag down a home's appearance. Dig out the dirt. You can do it yourself or hire a crew for a day, but a deep cleaning is essential for a good first impression. It's also key to keep up the cleaning as long as your house is on the market, which will probably mean a daily dusting and vacuum session. 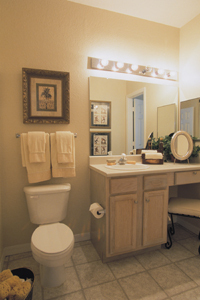 Bathrooms and the kitchen should be kept spotless. Banish bad smells. Air out your home by throwing open the windows at least once a day (or, in bad weather, by running all your exhaust fans). Don't cook smelly or greasy foods, which linger in the house. If you have cats, clean the litter box at least once a day. Use potpourri or bake cookies before buyers visit to give your place a "homey" smell. Organize what's left. Tidy closets and pantries look bigger and more appealing. Fix your floors. Real estate agents say buyers really notice the condition of floors. Hardwood should be polished and carpets shampooed or, if they're in bad shape, replaced. Repair any broken tile or linoleum. Brighten your walls. If you've painted or wallpapered in recent years, you may be able to get away with just washing your walls. Otherwise, consider repainting your rooms in neutral colors. Remodeling is for buyers, not sellers. Major renovations usually don't pay for themselves, let alone add enough value for you to make a profit, as I wrote about in "The hidden financial truth about remodeling." So why would you want to go through the hassle and the expense right before you move? Concentrate instead on smaller fixes with bigger impact, and let your buyers remodel to suit themselves. Beware of deferred maintenance. Buyers expect your home to be in decent shape. That means a roof that doesn't leak, paint that isn't peeling and household systems (heating, cooling, electric and plumbing) in good repair. If you've neglected your home, you face a tough choice. You're unlikely to recoup much of the cost of your repairs in the form of a higher sales price, since buyers are unlikely to pay you a premium for maintenance you should have been doing all along. Yet not making the fixes may turn off buyers altogether. Talk with an experienced real estate agent about which projects you should tackle before listing your home.